Even budget digital cameras come stacked with clever features these days – witness the arrival of the FE-3000, FE3010 and 12 megapixel FE-5010 from Olympus. 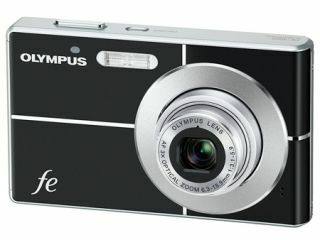 All three of the Olympus FE-series cameras slide in below the $200 price point in the US (UK pricing TBA). Among their talents, they boast Image Stabilisation and Advanced Face Detection technologies, plus VGA video recording modes. The Olympus FE-series digital cameras also feature 'Intelligent Auto'. This mode enables each camera to identify the scene being photographed (I.e. Portrait, Landscape, Night + Portrait, Macro or Sports) and to automatically adjust the settings for the best quality results. The FE-3000 is a 10 megapixel model, 0.7-inches thick with a 3x Optical Zoom, 16 shooting modes and a 2.7-inch LCD. Light blue, black and silver models will be available in January, priced at $139.99 (£92). The FE-3010 builds upon the specification of the FE-3000 above, but boosts the resolution to 12 megapixels and the shooting modes to 19. Magenta, black and silver models will be available in March, priced at $149.99 (£98). With the FE-5010, Olympus has crammed even more technology into the camera's slim chassis. Dual Image Stabilisation aims to eliminate blur from shaking hands or moving subjects. While a TruePic III Image Processor ensures incredible image clarity. The FE-5010 also boasts a 5x Optical Zoom, 2.7-inch LCD, 18 shooting modes and Advanced Face Detection. What's so 'advanced' about it? The software can track up to 16 faces at once, making it ideal for group shots. A 'Smile Shot' feature is also included, which fires off three consecutive shots when it detects that your subject is cracking anything resembling a photogenic grin. The FE-5010 is available in January, priced at $189.99 (£125) and in natty plum, navy blue and black versions.